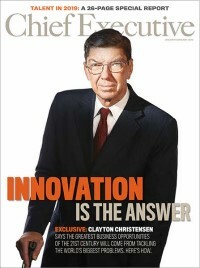 Chief Executive magazine (published since 1977) is the definitive source that CEOs turn to for insight and ideas that help increase their effectiveness and grow their business. Chief Executive Group also produces e-newsletters and online content at chiefexecutive.net and manages Chief Executive Network and other executive peer groups, as well as conferences and roundtables that enable top corporate officers to discuss key subjects and share their experiences within a community of peers. Chief Executive facilitates the annual “CEO of the Year,” a prestigious honor bestowed upon an outstanding corporate leader, nominated and selected by a group of peers, and is known throughout the U.S. and elsewhere for its annual ranking of Best & Worst States for Business. Visit www.chiefexecutive.net for more information.